The miniSpinner's orifice size of 5/8"(15mm) is perfect for spinning bulky or art yarns, but much too large for comfortably spinning standard yarns. We produce three sizes of orifice reducers so you can select the optimal orifice size for the diameter of the thread you're spinning. These stabilize your thread and prevent the thread from oscillating by bouncing around in an excessively large orifice. They're essential for spinning fine yarns! The number of rings denotes the size in 1/8" increments. These are made of acetal (Delrin) plastic with silicone o-rings to hold them in place. The easiest way to install them is to remove your flyer so you can see that it is inserted correctly. Hold the flyer's wooden crossarm so that it can't turn. Insert the reducer and twist slowly as you push it in. 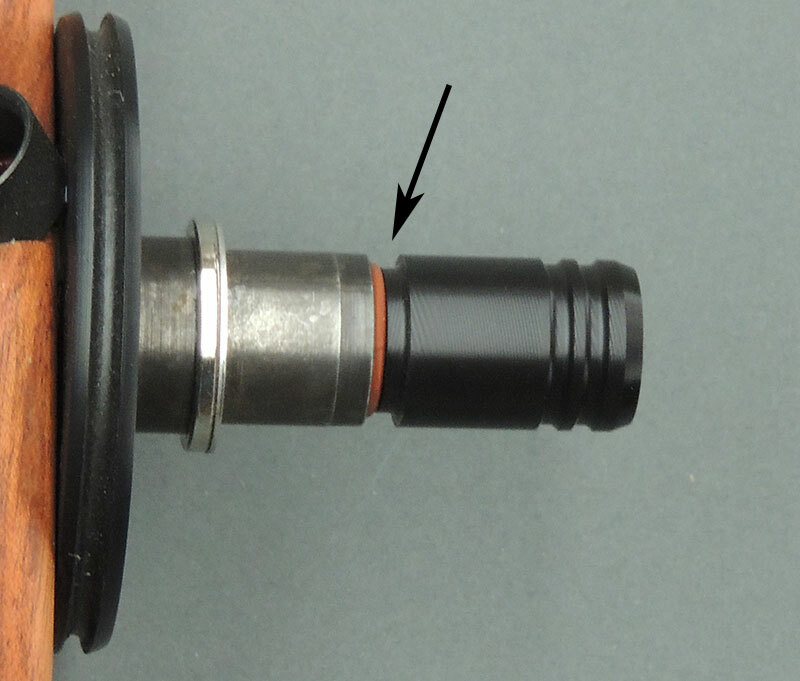 Both o-rings should be inside the orifice, and the plastic shoulder of the reducer should be touching the flyer orifice, as shown below. Note: Some early (pre-2011) WooLee Winders had a slightly smaller orifice, so the last o-ring won't fit inside the orifice. The reducer will still remain firmly in place, however. Also note: Orifice reducers are not available for and will not work with the modified Asford flyer that was used on very early miniSpinners. 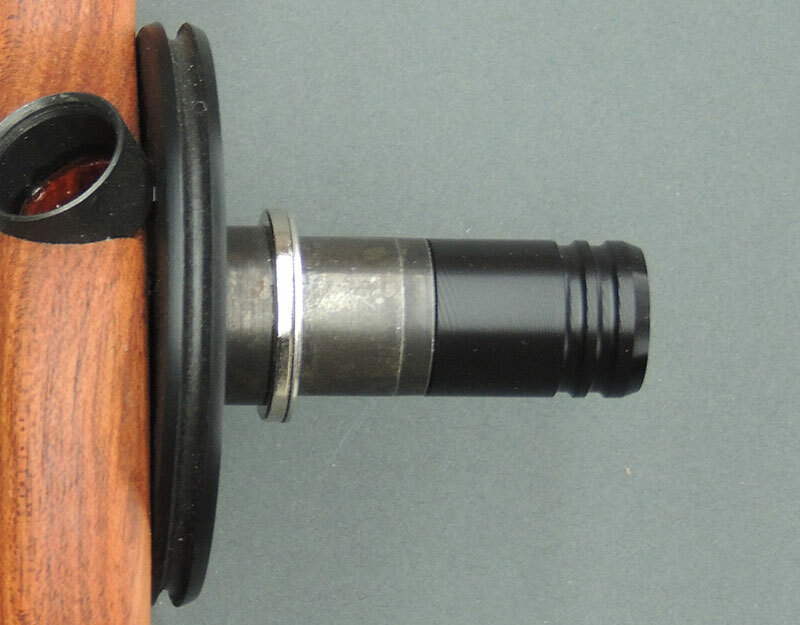 The inside diameter of the Ashford flyer orifice tubing varied from one to the next so that we couldn't assure proper fit. Grasp the wooden flyer crossarm, then pull on the reducer while slowly twisting it. 5 based on 20 reviews. I'm one of those people who thought "I've been spinning for 30 years on whatever I had - WHY would I need an orifice reducer??" So when I got my mS, I tried it without the reducer first. Yes, I could spin the kind of yarn I wanted. I did notice it wobbled a lot, but as I said, I've spun pretty much the same kind of yarn on all kinds of wheels for a long time. So then I inserted the reducer. I only got one (the 1/4"), because I know myself, and I'm NOT going to be swapping ORs around. I'm too darned lazy. I confess that I did notice a difference with the OR inserted. It was a little better for spinning my fine yarn. I don't think yarn wobble in the orifice bothers me as much as some, though. Try them, see what you think. Maybe some day I'll try the smallest one, just for curiosity's sake. The reducer was easy to install and seems solid and steady. I am so glad I got all three as it gives me lots of options for spinning different yarn sizes. Easy to insert and remove. The orifice for the MiniSpinner is large to accommodate art yarns. If you are spinning finer yarns, they tend to bounce about in the standard orifice. These reducers keep the singles under control, reducing wear on the yarn and the orifice. Oriface reducers do help 100% when spinning fine yarn! Loving my new 10mm orifice on my new to my v1 mS. Perfect fit, easy install, and looks sharp against my Wenge ends (on Maple body). I didn't think I would use these so I waited to order them. Easy to install and work like a charm. Glad I got them. I was concerned that the orifice reducers might not work with my older 'new to me MS (walnut #61) but they are fine and make a difference Maintenance kit is complete and the lubricants have made a good difference in performance of the machine. The orifice reducer installed very easily and is just the right size for the spinning I do. I don't spin very fine yarn so I just purchased one reducer and I'm happy to have it. No bouncing. It fits the WooLee winder as well and it easy to go back and forth between flyers. A second one the same size might be in my future so I can avoid moving it back and forth. I love the smaller orifice. I find it distracting to spin thin singles and have the yarn bounce around inside the larger orifice, so this reducer made me happy! Clicked in without a problem, and I'm ready to spin away. It is a must - I have the lace flyer and it really help the spinning. L'alimentation à la bobine se fait tout en douceur tout en maintenant son intégrité. I like that there isn't any wobbling around when I'm spinning. Makes for a smooth ride. This really helps with the finer yarns not jerking onto the bobbin. Very smooth drafting when plying. So glad I ordered the orifice reducer with my mini spinner. Totally does the trick!!! I received my reducers and am very pleased with the choice of sizes. There is an orifice size for all the types of yarn I make. They fit very well and just enhance an already great mini spinner. I never used one before because my wheel did not have the option to change it. Beth said just try the 1/4" one. I started to spin some fine yarn with the standard built in orifice. My yarn did bounce around which is probably one of the reasons I was frustrated with my spinning. The 1/4" has not been off the espinner since. It is very easy to install and very well made. As a whole package, if they had a 10 star option, I would give it.